The Health and Safety Executive (HSE) recently published its Business Plan for 2017/18. 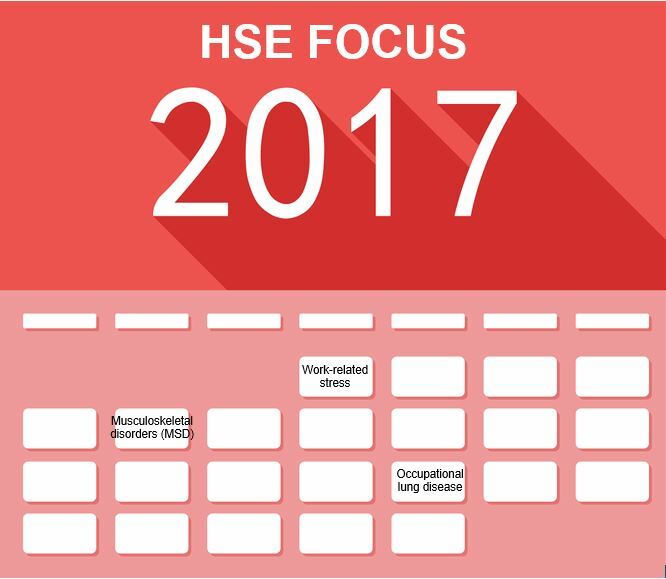 The business plan sets out the HSE’s main priorities for the coming year. Included within these priorities is the Health and Work programme. The Health and Work programme’s main aims are to reduce levels of work-related stress, musculoskeletal disorders and occupational lung disease. Work-related stress is the second most commonly reported cause of occupational ill health in Great Britain, accounting for 37% of all work-related ill-health cases, and 45% of all working days lost due to ill health. Work related stress develops because a person is unable to cope with the demands being placed on them. Stress, including work related stress, can be a significant cause of illness and is known to be linked with high levels of sickness absence, staff turnover and other issues such as more errors. Musculoskeletal disorders are the most common reported cause of occupational ill health in Great Britain, accounting for 41% of all work-related ill-health cases and 34% of all working days lost due to ill health. The term MSD covers any injury, damage or disorder of the joints or other tissues in the upper/lower limbs or the back. These injuries can be caused by incorrect manual handling techniques or repetitive tasks. Occupational lung disease continues to lead to an estimated 12,000 deaths each year and contributes substantially to work-related ill health. It includes a wide range of conditions, from those that develop shortly after exposure (e.g. legionella infections, work-related asthma) to those that develop many years later such as pneumoconiosis, COPD (chronic obstructive pulmonary disease), lung cancer and pleural mesothelioma which are life limiting and/or life-altering. It can occur in most industry sectors and is caused by a wide range of agents, from biological organisms through to dusts, fumes and vapours. Asbestos and respirable crystalline silica (RCS) are particularly substantial contributors to the burden of lung disease. focusing their inspection and enforcement activity where it can have the most effect. Thereby creating a greater awareness of the harm, costs and preventability of ill health in the workplace. For more information on the HSE’s Health and Work strategy and plans follow this link.